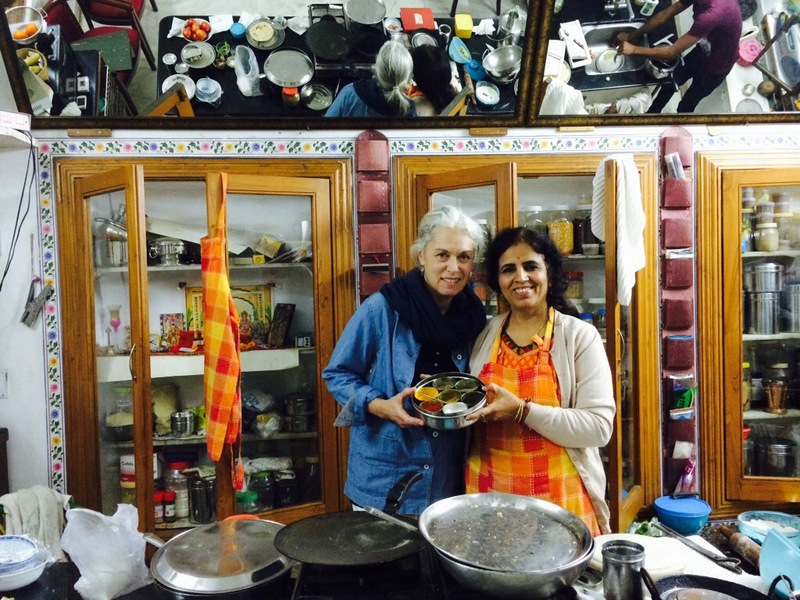 I have been meaning to write this post since I came back from India….. I promised to post some recipes so here it goes. 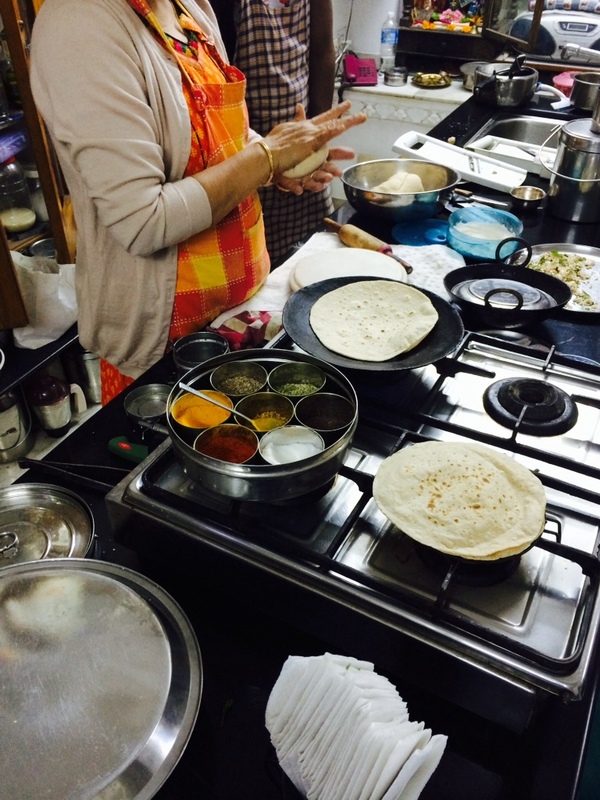 When we were in Udaipur we had the privilege of participating in a cooking demonstration. Spice is what gives food a definition. Two weeks eating Indian vegetarian dishes I came to the conclusion that there are five basic spices that are used in different combinations. 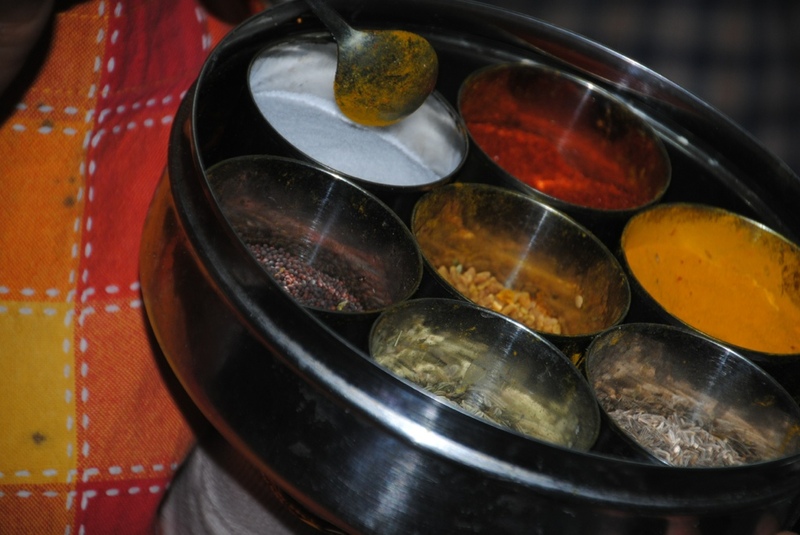 In the spice box we can find, red chili powder, turmeric powder, salt,cumin seeds, mustard seeds, fennel seeds and fenugreek seeds. All these help with digestion (fennel), brain memory ( cumin) and blood ( turmeric) in addition we use a combination of spices called Gara-masala which has black pepper, cinnamon, black cardamon, cloves, coriander seeds, bay leaves and cumin seeds roasted and ground. 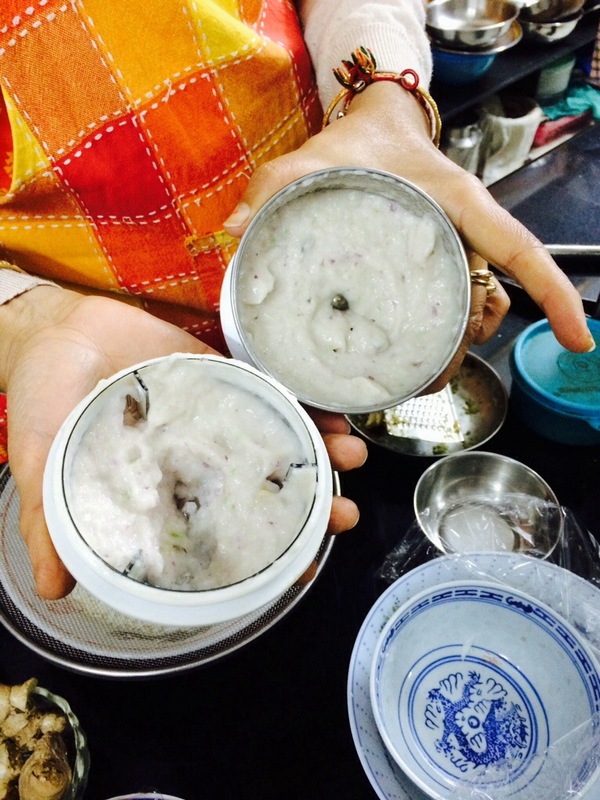 Dal is one of these dishes that we find almost in every meal. It consists of lentils, red, yellow, black or white. It is a source of protein so no need for meat. 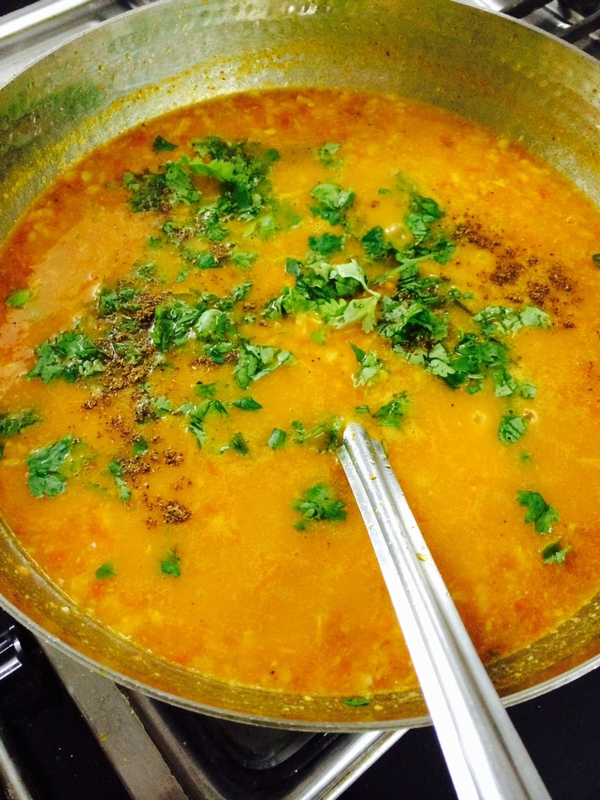 Boil the soaked dal (lentil) with 1/2 liter water in a pressure pan or over an open pan for 10 minutes. Take pan, add the onions and crushed garlic till brown then add all the spices and the tomatoes. Mix well and cook till oil and masala seperate. Then add boiled lentils and mix well. In the end, add pinch of garam masala and coriander, cover for two minutes. During our trip we had plenty of Chai Masala which is a black tea spiced with dry ginger, green coriander, black pepper, cinnamon and milk. The spices are combined, not roasted and ground into a paste. Bring to boil, add Assam tea or any tea leaves, now add 1 cup milk and sugar to taste. Bring to boil for two minutes, cover for two minutes , strain and drink. It’s a refreshing way to start the day instead of coffee. There are others dishes and let’s not forget the bread. In India, we did not use utensils but used the bread as a fork. The food tastes great. Slowly, slowly add the water and make a medium dough. It can be stuffed with spinach or onion or even condensed milk for sweetness. method: mix well, roll little dough, put the filling in the center and cover it from all sides. 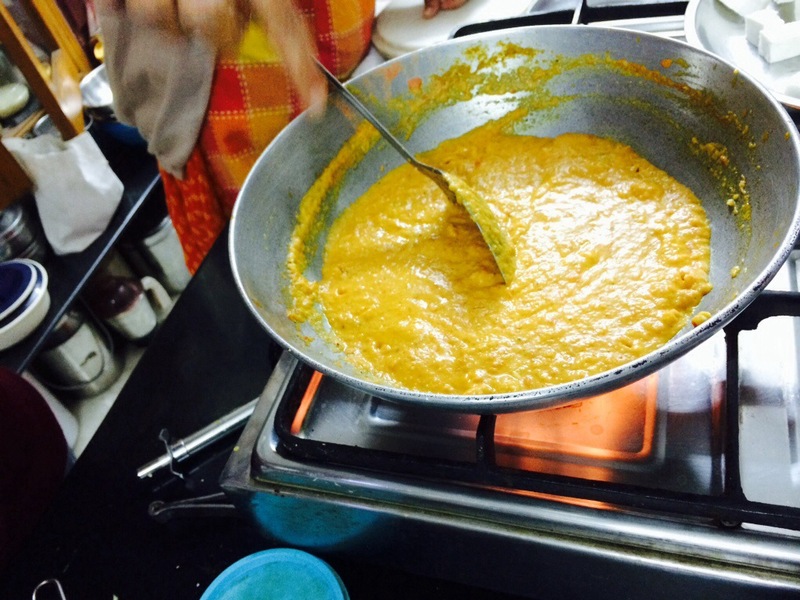 now roll it again and apply ghee or butter to both sides and fry on a special flat pan. It sounds a bit complicated so I promise a demonstration and a complete meal soon. 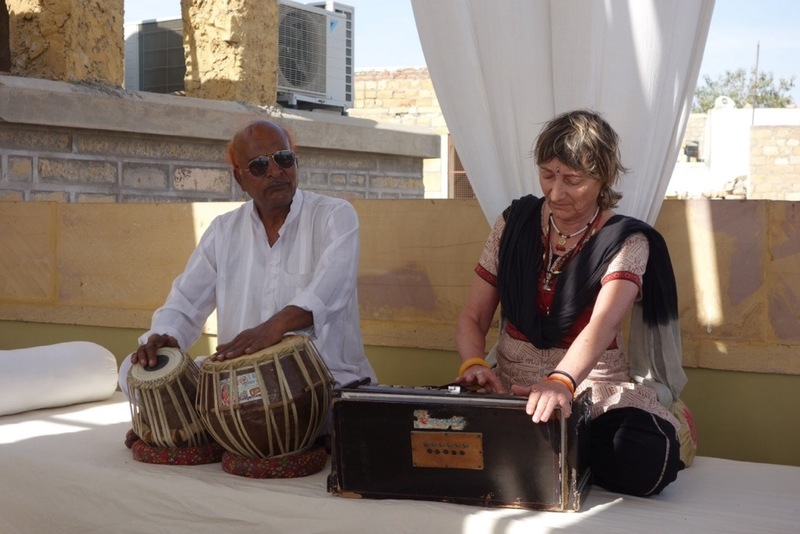 It is our last day, again we start with a 6 am drive from Jaisalmer to Jodphur, board a plane to Mumbai then a flight to Israel. It is a bitter-sweet goodbye, two weeks adventure. 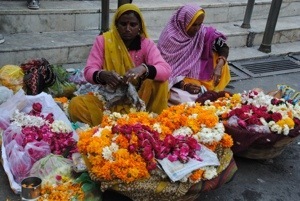 India is a complex place, there are lots of contradictions, lots of mysteries, lots to learn. It is so different but yet familiar. 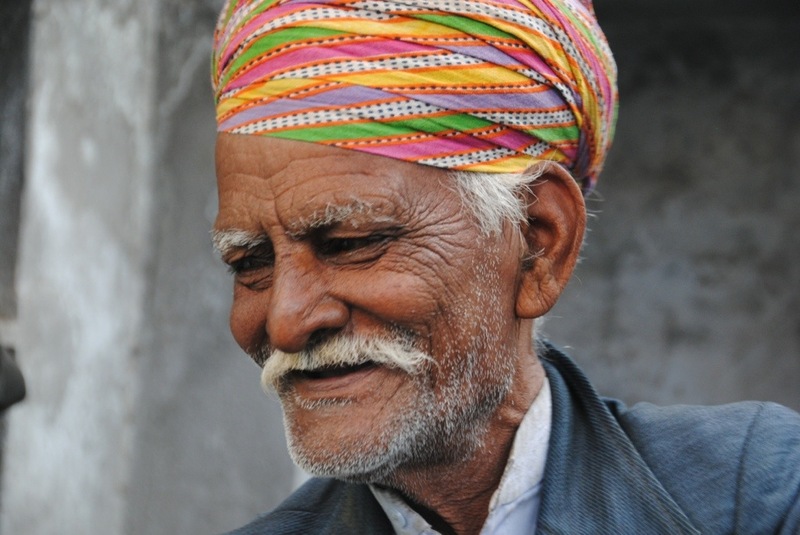 Hinduism starts with one g-o-d and there is all the deities each one with it’s own face, like “elilim”,is that what Abraham broke when he affirms the belief in one god. Mindfulness tours was the name of our tour and indeed in each city, each temple, one cannot escape the notion that there are layers upon layers of meanings. We were 21 strangers that became friends, cared for each other and learned to accept the differences. The literature festivals in Jaipur, we saw the future, the generation that tries to break from old traditions. At the women’s gno we saw how hard it is to elevate the woman’s place in the society, education is a key to advancement. 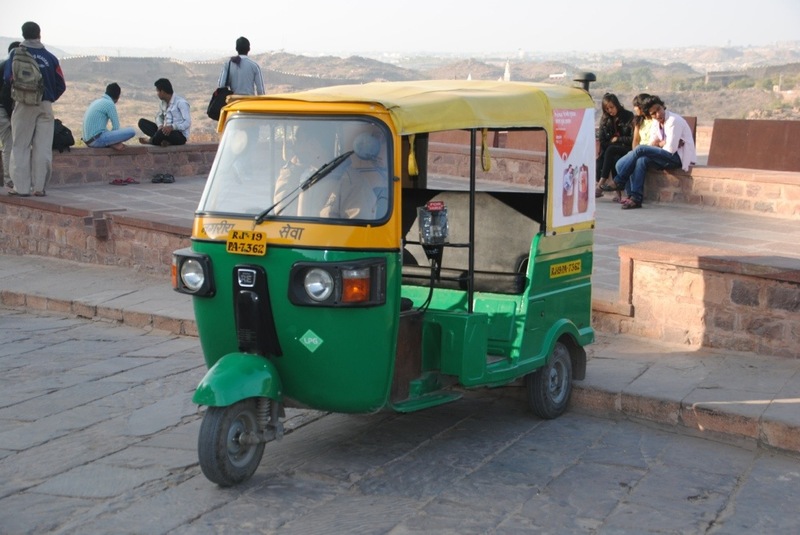 The palaces and forts are a symbol of the rich past but not all of them are well kept, some are dilapidated structures and then we see the Taj which is a magnificent building that draws lots of visitors. Some are keeping with the arranged marriage tradition and some are trying to break away from the caste system. As I am sitting on the plane to Tel Aviv, full of Israelis, some who finished a three month’s vacation through the south beaches and some who were on a tour of the country. India is a big country and we only covered the Rajasthan area. Will I come back to explore more? Maybe the north where the Dali Lama sits or visit the golden temple where they serve 100,000 people food with no charge. I can’t say yes or no but one thing I know that the effect of this trip will continue to make me think and be puzzled. 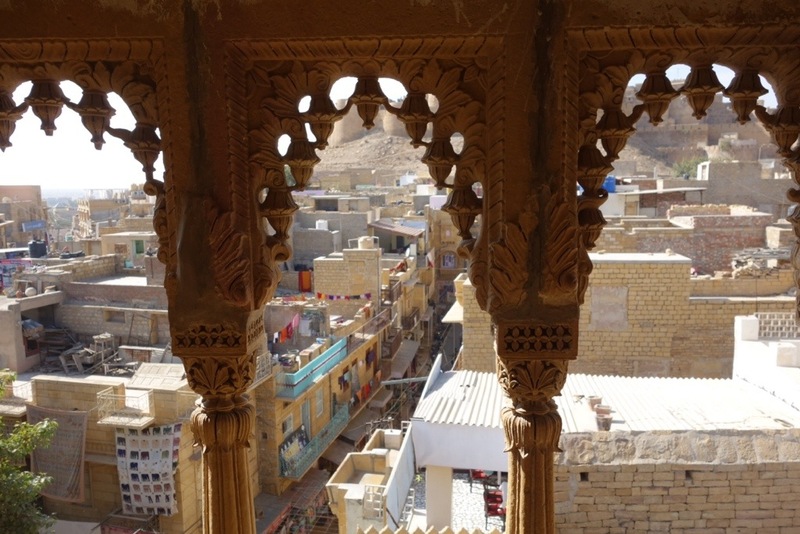 Jaisalmer is a desert city, 80 km from the Pakistan border.Jali is the name of the stone lattice work. The color of this city is gold which comes form the sand, although it’s known for the incredible silversmith works. We entered another fort ( I believe it’s the fourth on this trip), this one has four gates one cannot be seen from the other so you walk like in a zigzag. We entered the Jin temple and were able to take photos, their deity has a human like features and no adornments just an innocent smile..This is a “working” fort, people live within the walls, the streets are narrow , the market is bustling with merchants offering all sorts of stuff form pashminas to Kama Sutra books to bags and more . It’s a popular tourist destination. 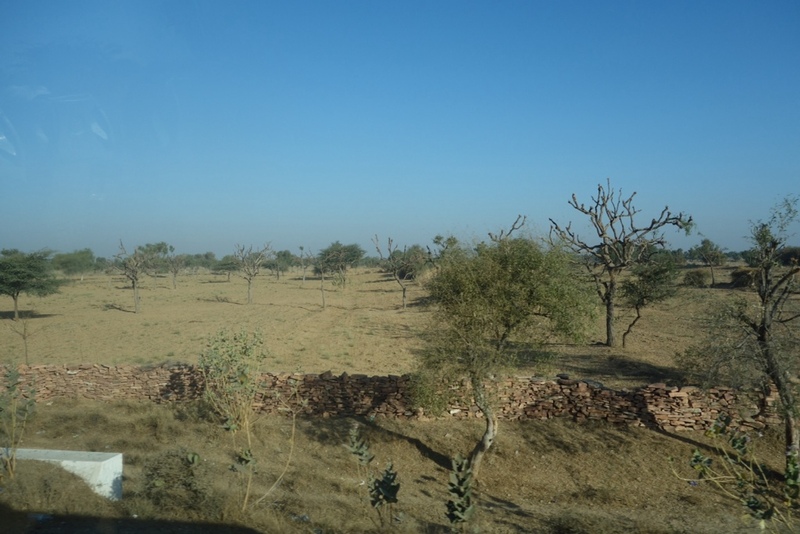 Our guide told us that there is a popular Indi movie that was filmed in the city , that explains the groups of students we met who cam on a two day train journey from Delhi. Lunch was served on the roof of a hotel over looking the fort. 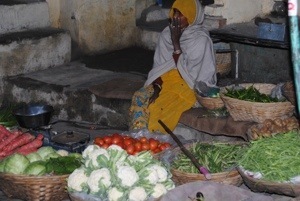 In the last two weeks we tasted the food, smelled the spices, enjoyed the colors and heard folk music. Surprise waited for us, a lesson in traditional Indian music. We learned that there is order to the rythm, to the movement of the dance , to the gestures and the words. There are sixteen notes that keeps repeating. It felt soothing and transformed us to a maharaja palace where he is listening to his court musician. After lunch we walked to the silversmith home , I must have been day dreaming as I bumped into a cow and then stepped in her S.., they say it’s good luck but i got startled..the streets are filled with cows walking around like they own the place with no regards to motorcycles or people. The attention to details is fascinating, in the chaos of the street there is order. Six hour bus ride; through the desert pass different towns. This time we watched an Indian movie – Taare Zameen Par, every child is special produced and directed by Aamir Khan, An Indian actor who cares about social justice causes. The film is about a child with dyslexia. His parents cannot accept the fact that he has a problem nor does his teacher, but there is an art teacher who recognize it and helps. And as in every Bollywood movie there is a happy ending and the kid wins the school art competition and recognition by his father. 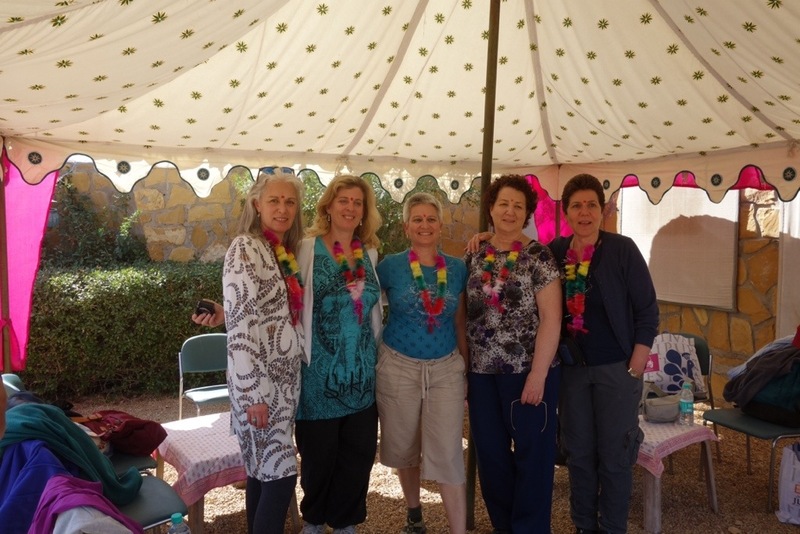 We arrived at Mama’s resort, an oasis in the desert with fancy tents. We went on a camel ride to the dunes. The scenery reminded me of bible times. I saw women at a well and could imagine Eliezer meeting Rebecca there. We tried to meditate on the dunes waiting for the sunset but for some reason it was a popular place, jeeps came by, children looking to sell chips and drinks, who knew..finally it was quiet . The sun went down. So what do we do for dinner? Outdoors it is with a bonfire and dancing. A mix of belly dancing and Bollywood kept us warm. Again chai amsala, paneer and a new dish mini eggplant in masala sauce. How romantic it sounds to sleep in a tent , not on a floor but on a bed , but it’s desert and it gets cold at night so I went to sleep with all my cloths. This is the third post in the past 24 hours. I have so much to share so forgive me if it is too much and I hope you will enjoy the ride. 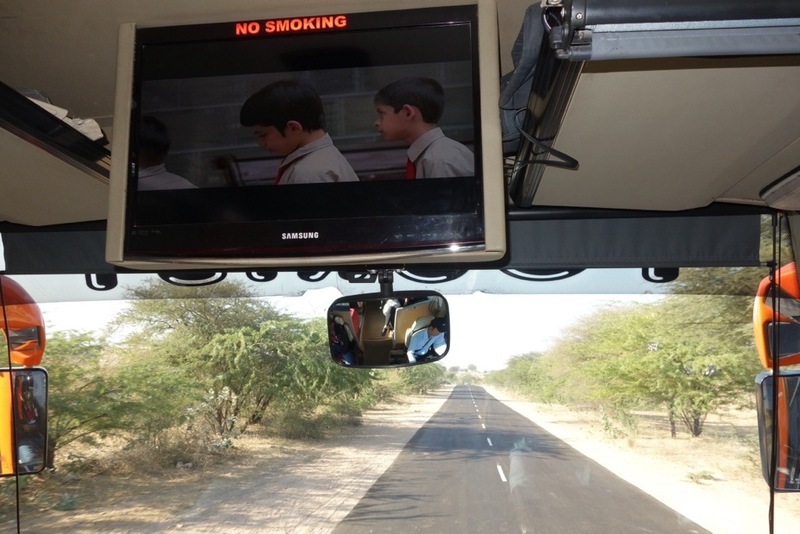 Being on a bus for 7 hours for the ride from Udaphur to Jodphur was not too bad, we watched a great movie called “outsourced”, stopped for Chai at a nice spa and soon after arrived at the blue city. There are almost 2 million people living in this city. The Mehrangarth is a fort that towers over the city. From one side one can see the old city with it’s blue color buildings, they say its the color of kings, on the other side the new city spreads. 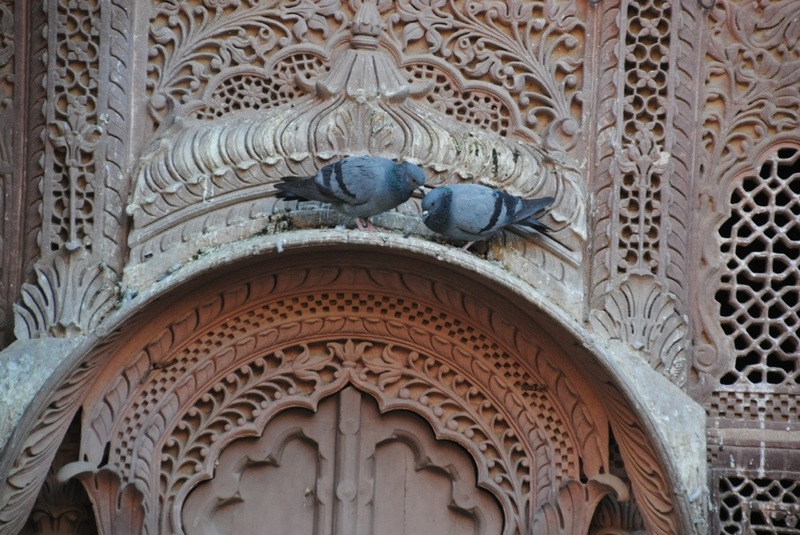 The fort was build form stone and the intricate work is unbelivable. The carving are made in stone but it gives the illusion of carving in wood. 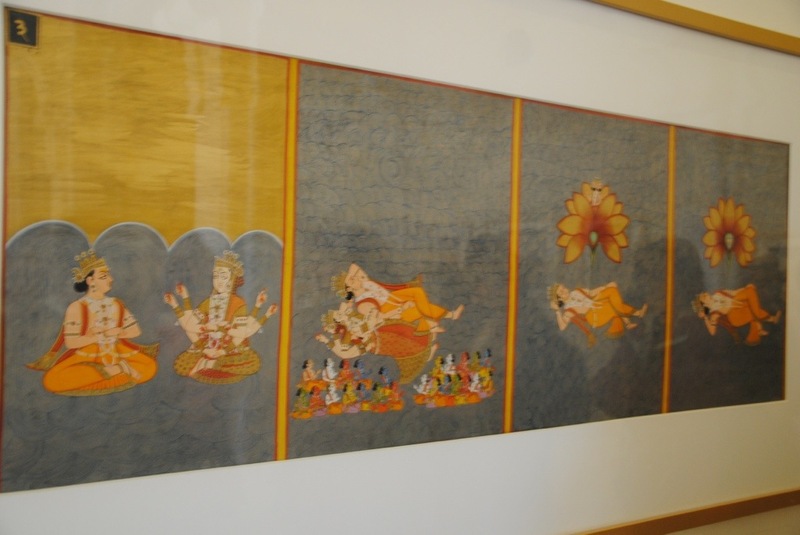 Once entering there are displays of miniature paintings, textiles and wall painting which are unbelievable in their intricacy. I treated myself to an ayurvedic massage that started with half an hour oil pored over my head and ended with a 10 minutes steam. I came out rejuvenated and ready for Shabbath. Shabbath at the Ranbanka Palace hotel started with mindfulness two and half hour meditation lead by Dina. We meditated to the מודה אני ושמע ישראל , we practice walking meditation and did an exercise with a partner asking each other- what do you really think multiple times, we continues after lunch and rest into a two hour yoga. The combination of meditation-yoga-india worked after a week of intensive travel we all needed to recharge. Cows, buffalo, dogs, pigs a whole zoo walking in the street. You are not allowed to eat any and if by mistake you kill a cow you have to feed the whole village-have a party and dip in the gangas river which is not so clean.. Some eat chicken or goat meet but as our group keeps kosher it is easy to stick to non meat and some time non dairy diet. Most dishes have protein in the form of beans. Then use of spices like turmeric, cumin, fennel, mustard seeds and red chili powder adds amazing flavor and let’s not forget vegetables like tomatoes, onions, eggplant and more makes it easy to be vegetarian for two weeks. Lunch was served in something called Thila, a round platter with small bowls, each contains a dish, rice in the middle and Nan, so you supposed to pour the dal or paneer on vegetables masala on the rice and eat with your right hand. Eating with your hands adds to the taste. The thing with Indian cooking is that there are those 7 spices , red chili powder for taste, turmeric for blood circulation, cumin for brain and sharp memory, black mustard seeds for digestion,fennel seeds for digestive and Fenugreek seeds for arthritis, and another mixture of spices called Gara masala which includes black pepper, cinnamon, black cardamon, cloves, coriander seeds, bay leaves and cumin seeds, roast them and grind. This can be kept in closed container for years. The last night in Udaphur we were treated to a cooking class. I got real excited, the mystery of cooking dal, paneer, masala, nan and more will be revealed. I promised an Indian meal on my return but here is something different to have any time of the day . We all love tea and in India we have the chai masala, a black tea with a mixture of dry ginger, cardamon black pepper, cinnamon all mix in equal parts and grind. To make chai boil 1 cup water with 2 pinches of the chai masala add assam tea leaves, add 1 cup milk and sugar to taste bring to boil for two minutes and again ( just like Turkish coffee) cover it for two minutes and strain. Yesterday we had the most incredible day it started with walking to the Jagdish temple,climbing up steep steps , taking off our shoes, listening to the chanting, getting a red dot on the forehead. The hindus love their temple, the carving in the marble stone are intricate and tell the stories of the different lords. 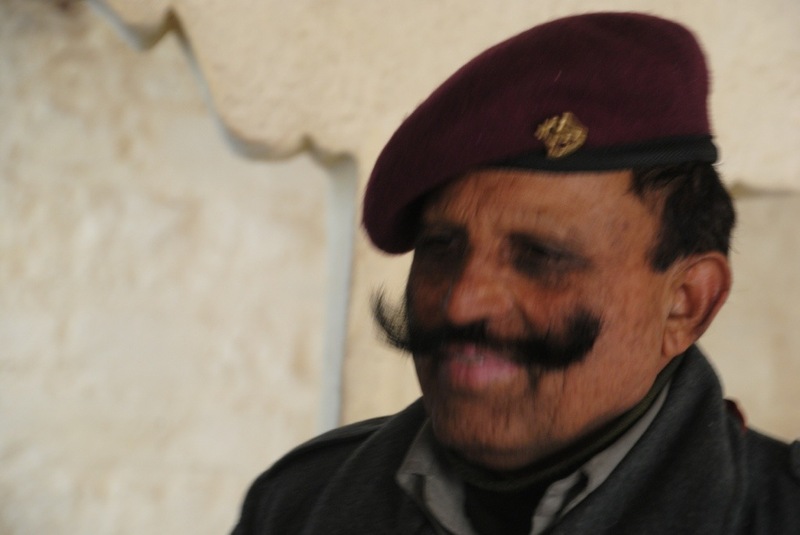 Udaphur is known for it’s artists. There is glass mosaic and miniature drawings. I chose the drawing workshop. We came to an artist cooperative, the artist helped us create our own elephant drawing using paints like orange tumeric, blue lapis, grey purple for the elephant body. All are minerals from the ground. I was in my element. 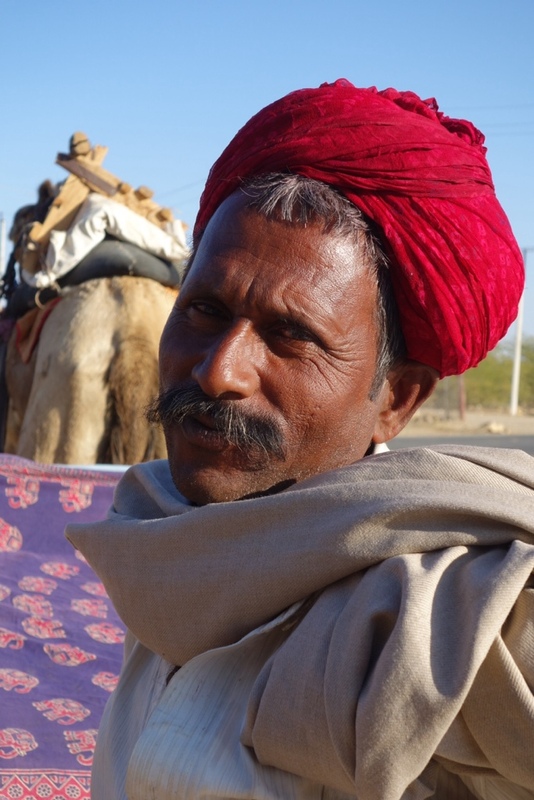 I was transformed into a magical world, there are three symbols for the Rajasthan state, the elephant is luck, the horse is strength and the camel is love, each also relates to a different city, the elephant for Jaipur, the horse for Udaphur and the camel for Jaisalmer. 28 km outside of Udaphur there is a village called Delwara, a town of 5,000 people from 27 different castes and different religions. 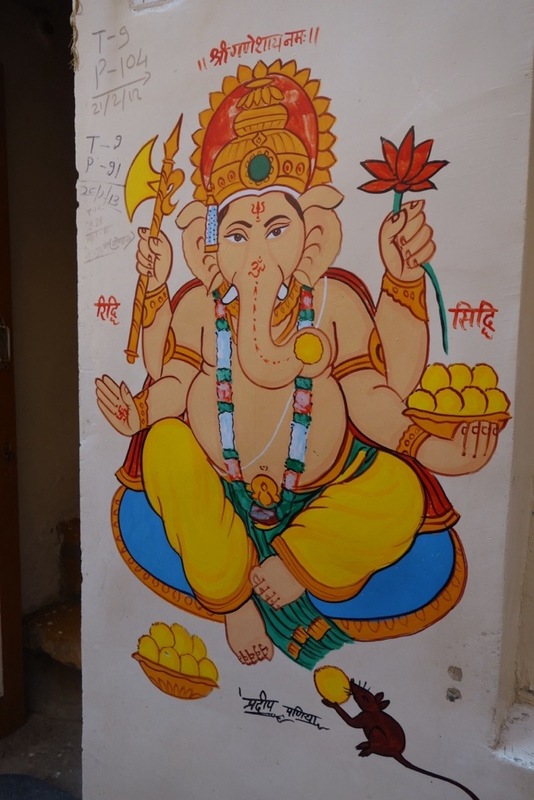 Seva Mandir which is a non profit NGO (non government organization) founded the Citizen’s Development forum, together they transformed the town infrastructure. 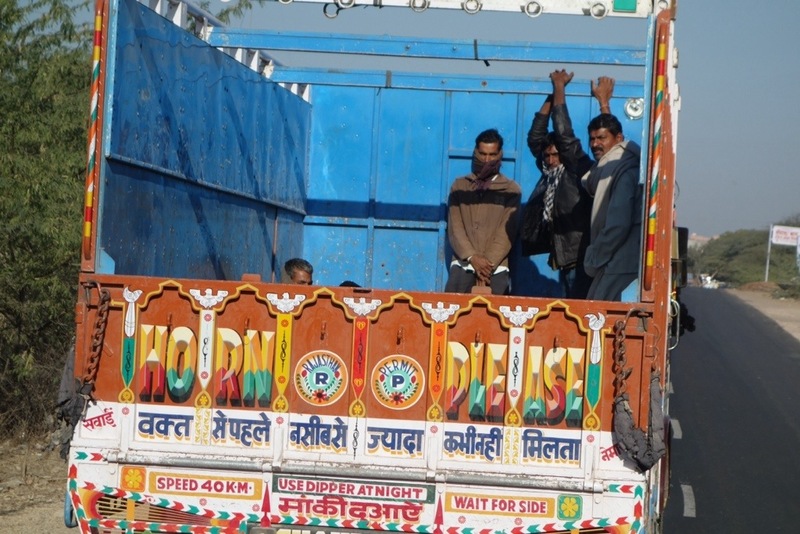 Major changes were accomplished which include sanitation, half of the households did not have toilets or running water. They created a step well. They build youth centers . We were taken on a heritage tour by a young man, there are incredible Jain temples. 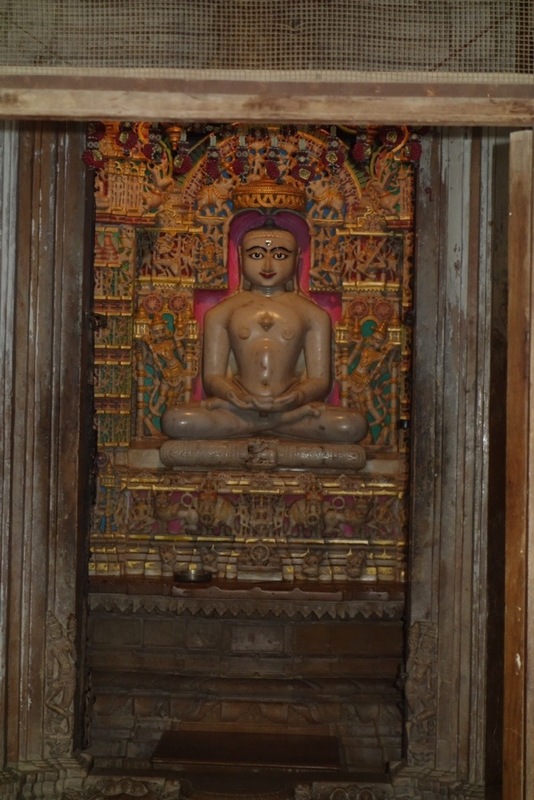 Jain religion has a different god, a human like figure that is not adorned in cloth like the hindu gods. They helped women organize themselves into self help groups, they created a Sadnha where they make cloths that sell at the Fab India store. Some of these women come from abused homes and this is their way for independence. Seeing garbage on the street is a common sight, whether it is the big city like jaipur of the smaller city of Pushkar but the village of Delwara look cleaner in comparison. 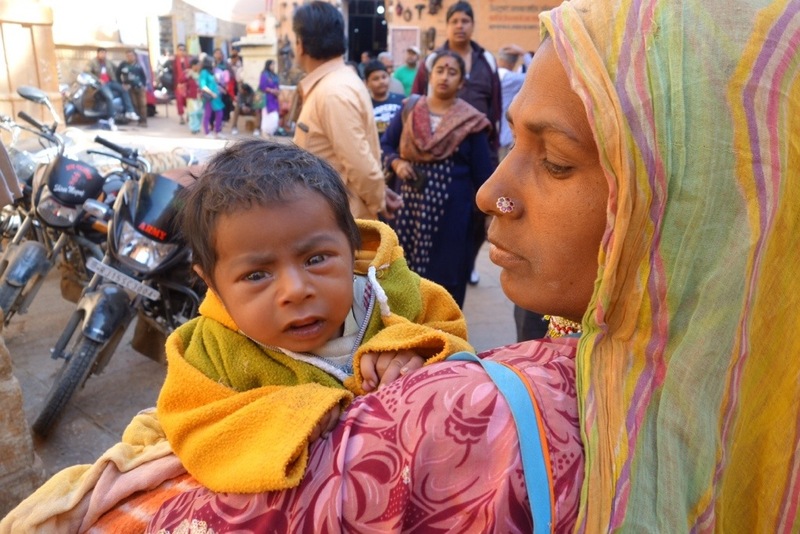 With the help of NGO’s like Seva Mandir or the Barefoot College we saw outside of Pushkar there is hope for a cleaner , more civilized society. It’s been a long day, rewarding and intriguing. We were treated to a cooking class. It was a delight. I got really excited, You all know I love cooking so I was in my element. I got to stir the base for the masala. Home cooked meal tastes so much better then a fancy restaurant. What a day, it felt like India in a day – pray,art,people,food. Colors, Smells, Taste . 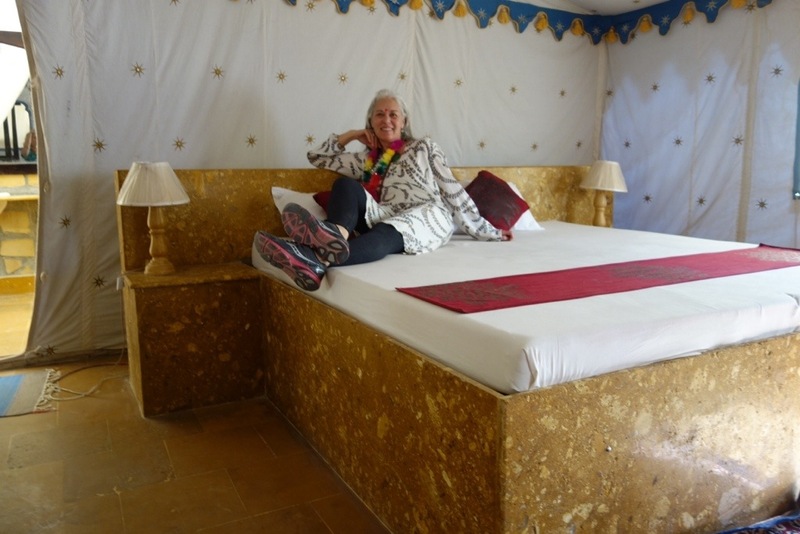 It took a night flight from Tel aviv, domestic flight from Mumbai to Jaipur, 45 minutes drive from the airport and we arrived at our first palace. well kind of as it it a Maharaja palace that was converted to a hotel, with old english furniture, canopy beds and beautiful fabrics, old fashion courtyards. Everyone wants to help, no is not in their vocabulary. We were treated to a typical vegetarian Indian diner with entertainment, belly dancer and puppet show. I really did not know anyone from the group of women I am traveling with, except Dina. Most of them came from Jerusalem, they made aliya 20-30 years ago. I look forward to getting to know them all but the truth is that all I want is to absorb the Indian culture, to learn as much as I can. I placed myself in a zen like state so I am not upset if my room is smelly, well they changed it and I got a nice big room . still there is a smell that will need to be explored, it could be part of the air. One day is over and so far I experienced the tourist side, tomorrow we start with meditation and then off to to see a temple.